The word “scapular” indicates a kind of clothing that is similar to the apron monks wear when they are working. 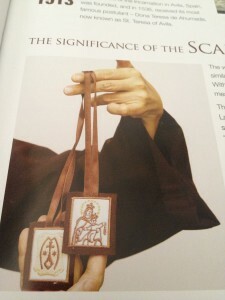 With the passing of time, the faithful gave other symbolic meanings to the scapular. The Carmelite Order has a rich tradition of devotion to our Lady and the Brown Scapular has become a sign and symbol of this special dedication to her motherly protection. This spiritual meaning has been approved by the Church. To listen to the word of God, and put it into practice. To pray at all times, as a way of discovering the presence of God in all that is happening around us. To share in the paschal mystery of Christ by means of voluntary penance. This devotion of wearing the scapular has become, like other devotions to Mary, a rich treasure for the whole Church – an expression of love and trust in her motherly intercession.